Two Southeast Asian women on trial in Malaysia for the brazen assassination of the North Korean leader's half-brother could be acquitted Thursday or called to enter their defense in a case that has gripped the world. 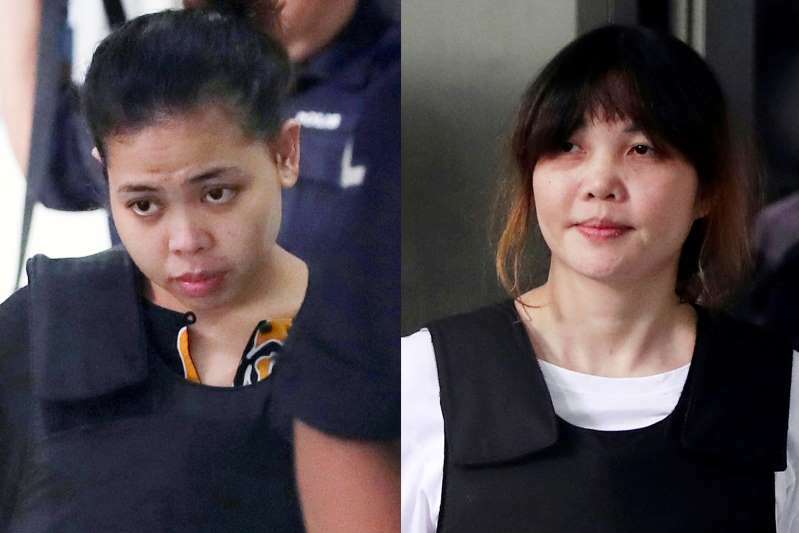 Indonesia's Siti Aisyah, 25, and Vietnam's Doan Thi Huong, 29, are accused of smearing VX nerve agent on Kim Jong Nam's face in a crowded airport terminal in Kuala Lumpur on Feb. 13, 2017. The women have said they thought they were taking part in a prank for a hidden-camera show. They are the only two suspects in custody and face the death penalty if convicted. If the defense is called, the trial could take several more months. If the women are acquitted, they may not be freed right away as prosecutors could still appeal the decision as well as push forward with separate charges for overstaying their visas. [post_ads]Over the course of the six-month trial featuring testimony from 34 people, prosecutors laid out a bizarre murder plot they likened to something from a James Bond film. They accused four North Koreans, suspected government agents with code names such as "Mr. Y" and "Grandpa" and later identified by police, of being the masterminds who recruited the women, trained them and provided them with VX. All four fled the country the same morning Kim was killed and none are in custody. Airport security footage shown in court captured the moment of the attack and prosecutors said linked the women to the other suspects. Shortly after Kim arrived at the airport, Huong was seen approaching him, clasping her hands on his face from behind and then fleeing. Another blurred figure was also seen running away from Kim and a police investigator testified that it was Aisyah. Investigators said the women were seen rushing to separate washrooms, each with their hands outstretched, before they fled the airport. Kim died within two hours of the attack. A government chemist testified that the VX concentration found on Kim's skin was 1.4 times greater than the lethal dosage. He said VX was found in Kim's eyes, face, blood, urine and clothing, as well as on both women's clothes and on Huong's fingernail clippings. In his closing arguments in June, prosecutor Wah Shaharuddin Wan Ladin said the women must have been trained to use VX, a rare nerve agent developed as a chemical weapon. He said they had to know the best route for VX to enter the victim's body and know that they must wash the nerve agent off themselves within 15 minutes to avoid being contaminated. With Kim a tall and heavy man, the prosecutor said the women had "used their bodily power" to deliberately target the poison on his eyes and face for faster penetration. Despite their claim about a prank, he said their facial expressions and conduct during the attack didn't reflect any humor. "We expect that the defense will be called for a simple reason: They need to explain why VX was found on them," Wan Shaharuddin told The Associated Press. Lawyers for the two women say their clients were simply pawns in a politically motivated killing with clear links to the North Korean Embassy in Kuala Lumpur. They say the prosecution's case was too simplistic, handicapped by a sloppy investigation and failed to show any intention on the part of their clients to kill — key to establishing the women's guilt. The defense said evidence has shown the women's conduct before and after the killing was inconsistent with that of assassins, pointing out that they didn't wear gloves when applying VX, didn't dispose of their tainted clothing and didn't flee the country. The real culprits, the defense argues, are the four North Korean suspects. The four were captured by airport security cameras discarding their belongings and changing their clothing after the attack. The North Korean Embassy has also been implicated with an embassy official helping get flights out for the four men and using the name of one of its citizens to buy a car that was used to take the suspects to the airport. Nevertheless, Pyongyang has denied accusations by South Korean and US officials that it was behind the killing. Malaysian officials have never officially accused North Korea and have made it clear they don't want the trial politicized. "The prosecution's evidence is purely circumstantial," Aisyah's lawyer Gooi Soon Seng said, noting that there was no proof that his client applied VX on Kim. He said his client's DNA was not found on a shirt recovered by police. Huong's lawyer Hisyam Teh Poh Teik said they have given prosecution "a good fight." "We are confident that justice will be served on Thursday and (Huong) will be acquitted," he said.